UPDATE: Jimmie Sue received her transplant on September 11, 2013 and is doing well. As she must return to the transplant center frequently for follow-up appointments, she is incurring significant travel related expenses. 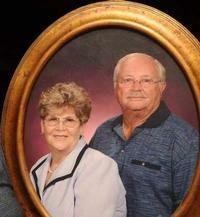 Jimmie Sue and her family greatly appreciate your continued support! Please let me tell you about my wonderful wife, Jimmie Sue, and why I’m so desperate to save her life. We met in 1956, cruising around the town square as boys and girls did back then. It was love at first sight. We dated for six months and then got married. We were madly in love and wanted to have a family. It didn’t take long before our family of two became five, with the addition of a daughter and two sons. We never had much but we had enough. And mostly, we had each other. When Jimmie Sue was diagnosed with kidney disease, I was devastated. She is my everything and I can’t lose her. The first thing I wanted to do was give her my kidney but it turns out that not only is my kidney not a match for her, but neither are any of our children’s kidneys. So, I started walking around town wearing a big poster with my phone number on it and the words “Need Kidney 4 Wife.” People may think I’m a little strange but when I tell them about my Jimmie Sue, they understand. So, I need someone to give Jimmie Sue a kidney, because the wait list is many years too long and she needs one now. But, if you can’t give her your kidney, then we need financial assistance to help with all of the medical bills associated with this disease and the hoped-for transplant. To help with this financial burden, a fundraising campaign in Jimmie Sue’s honor has been established with HelpHOPELive, a nonprofit organization that has been assisting the transplant community for 30 years. All donations are tax-deductible, are held by HelpHOPELive in the South-Atlantic Kidney Transplant Fund, and are administered by HelpHOPELive for transplant-related expenses only. Please consider making a donation to help Jimmie Sue. Please help me save the life of my sweetheart. How do I find out if I am a match? I am fixin to call the university back to talk about donating! I hope everything works out for y'all!! I am trying to find out if you have or have not found a kidney match. Willing to get tested to see if I am a match for Jimmie Sue..
My name is Melissa and I live in VA. I have one daughter, a wonderful husband, and another baby on the way. But I wanted to give you some hope. My due date is March 17th, 2014, and I have to wait a few weeks after I have the baby, but I would like to pledge my kidney to your wife. I am 0 positive, and have always wanted to donate a kidney to someone in need. Let me know if that is too far out. I wish you the best of luck! Please help my mother-in-law find a donor soon! I am O positive and a very healthy 29 year old male. I am willing to give up my kidney to help save a life. Please contact me at [email protected] I am in the service, Navy, stationed in Hawaii. If anyone is interested in being tested to see if they are a compatibly match to donate a kidney to Jimmie Sue Swilling, please call Medical University of South Carolina, kidney transplant department and ask for Jodi Schwartz. Thank you. I came home from Church today and saw a story on facebook regarding your story. I would be willing to be tested to see if my kidney is a match. I saw your story on facebook. Very touched and hope to be of some service to you. God Bless! If you wife still has not received a kidney, you need to search facebook. Someone has posted your story and there are thousands of responses!! Wishing you and your wife all the best! Did your wife ever receive a kidney? Praying for you all and praying for the funds! !